New Jersey has a penchant for churning out some of music’s biggest up-and-comers in the music word, and alternative five-piece The Stolen are no exception. The band have been working hard since they first stepped onto the scene and show no signs of stopping anytime soon! Planet Stereo had the chance to sit down with Dom Cuce, vocalist of The Stolen, to talk about life on the road, creating music, and just what’s on his Christmas List this year. Planet Stereo: Hey, how are you? Dom Cuce: I’m good thanks, finally took a break for lunch [laughs]. How about you? PS: I’m well thanks. You’re in Nashville today, is that right? DC: Yeah, we’re really enjoying it! It’s a really cool place to be! PS: Yeah, it must be. Everyone seems to be there today [laughs]. DC: It is! We just finished up lunch, so we’re enjoying it, and it’s a great place for musicians. PS: You’re currently on tour with The Big Time and We Are Forever. How is the tour going so far? DC: So far, it’s been awesome. Our first day of the tour was in Indianapolis. We’d never met them prior to that, so we’d never spoken to them, and we didn’t really know what to expect. We finally met them, and they’re just awesome guys; they’re great musicians, great people, you know, just cool people to hang around. PS: So no pranks yet? PS: I also saw a video from the first day of tour, and it looked like you guys were already off to a very interesting start…and you guys seem to eat the strangest things on the road! DC: [laughs] Yeah…eating on the road is pretty crazy. Personally, I try to eat as healthy as I can. So everyone will go and get these crazy fast food things, and I’m just going to go and get a salad or something. But yeah, on the road, you eat some crazy things, uh, at two a.m. there’s not really much to choose from. PS: No kidding. This is when everyone sends a silent ‘thank you’ to WaWa and their fresh foods. DC: Yeah, you take what you can get on the road sometimes. […] Being from Jersey, WaWa is always right around the corner for us, so we just always go there. PS: And every state seems to be getting them! DC: Right?! We stayed with a buddy in Orlando last summer, and we were right down the road from a WaWa, and we’d been on the road for a few weeks, so we hadn’t seen one. So we went there for, like, every meal. It’s an addiction. PS: Speaking of touring, you guys do a lot of it! I mean, you just grind it out consistently. How do you guys even function being on the road this often? DC: I feel like, well, tour is our norm. We’re so used to it now, and, while it’s not necessarily something we look forward to all the time, it…at least, for me, anyway, it feels like what we’re supposed to be doing. It feels right to be on the road, and like, we all have other things we need to do; I’m in school online, and so are two other guys in the band, so, we just have to be on top of everything. You can’t wait to do your school work, you have to do it when you have the time. So touring for us, like I say, is the norm, and it feels right, so it’s easy to function for us. PS: What is something you’ve learned on the road that you wish you’d known back in the day? DC: Hmm…That’s a tough question, but I like it. You know, I’ve actually learned a lot more about cars. Like, back in the day, when I was in high school, I really don’t know much about cars, and after all the vans that we’ve been through (we’ve been through a couple already), they’ve had their fair share of problems [laughs]. I’ve learned a little more about cars and stuff in general. I guess I could say that I wish I knew then what I know now about vehicles. DC: Yes! [laughs] Pretty much! PS: So, back to the music, you recently released your new single, “Chardonnay,” which, I have to say, sounds so upbeat, but the lyrics are so sad! Where did that come from? DC: Um…it’s kind of like, the way that we looked at it for the music video, kind of “deer in headlights,” this girl is trying to take out this guy, and he’s not really sure, kind of oblivious, stuff like that. We tried to translate that meaning into the video, if you’ve seen it? PS: I did. It was really well done. I liked it. DC: Oh, thank you so much. Yeah, we just wanted to make a different video. PS: So when you’re writing, do you try and stay consistent with your sound, or do you just write the song and hope that it fits in? DC: Well, recently with our writing, we now have a direction that we know we want to go towards. We recorded [Adults EP] with Jesse Cannon and Mike Oettinger, these two guys, and it was a good start for us, and we started releasing singles. Then we released “Chardonnay,” and figured out that we wanted to go in that direction, and everything we’re writing is going that way. We’re all really pleased. It’s the best stuff we’ve written since we started writing our own songs. PS: Well, you also recently released an old song, “Memoir.” What made you guys want to record the song after three years of it sitting on a shelf? DC: It’s crazy! “Memoir” was always that song that we personally loved and we knew that other people loved it as well, and we’re like, “You know, let’s bring it back,” because we thought it was such a good song–not that we want to toot our own horns! But we’re very proud of it, and we just wanted to bring it back, and just see what people think, because we love the song. PS: The funny thing is, it was such a flashback for you guys, and I had a flashback myself. When I saw your name, I was like, “I know that band. I know I know that band…” And I figured it out last night. PS: Yeah, I actually interviewed you guys back in 2011 when I was working for Danny Says! PS: Wayyy back in the day! PS: I think I just aged both of us. DC: Yeah, I’m only twenty and 2011 just feels like…wow. I was so young. PS: [laughs] Me too! I think you guys were actually working with Scott Nebb at the time. DC: Yeah! Scooter’s been a really good friend of ours for a while; he’s been on a couple of tours with us, and I think it was two summers ago, we took him on tour, and he was helping us out with so much stuff. He’s a very smart guy, and definitely knows what he’s talking about, so it’s nice to have someone of that caliber out on the road with you. PS: Definitely. And that actually leads me to my next question: what have you learned since 2011, working with producers and other musicians? DC: Hmm…there’s so much that you learn. Producer-wise, we just recorded “Chardonnay” with Paul Leavitt, and you learn so much with that guy, like, the recording process, how to change the song, etc. There’s such a long list. I wish I could talk about it for hours, because I honestly have learned that much. As for touring with other bands, I don’t want to say I didn’t learn anything, because we’ve learned from our experiences on the road; they’ve really molded us as individuals. Our friends have never had to deal with a van breaking down in the middle of a state, or something like that. There’s just different scenarios that we’ve learned in that others haven’t had the chance. You learn so much more by experience on the road than you do in a classroom. PS: I don’t doubt it. That makes me question as well; you said you were doing school online. What are you majoring in, if I’m allowed to ask? DC: Of course! I’m currently majoring in marketing. So I’m able to just take my laptop on tour, and whenever I can, whenever we’re at a hotel or anywhere with wi-fi, I do some work, and hopefully get it done before the deadlines. PS: It’s funny, in my last interview, I asked about social media and how much it’s changed. Do you guys struggle to keep up with all of these platforms, now that it’s gone from the Big Three to the new…eleven, or whatever it is now? DC: Yeah, with social media, that’s always something we’ve always been really on top of. As an individual, I love social media. I mean, not to the point that I’ll be sat having a conversation and on my phone the whole time, but I love the idea around it. Like, how you can spread something instantly, and how, even though it’s a sad event, with Paris, we had that information in an instant. So the Internet can spread so much so quickly, and we’ve definitely done our best to stay on top of that. We’re good at it. We like to stay on top of our social media, and posting, and staying in touch with fans. PS: It sounds like you guys have a good system with it. You actually brought up exactly what my next question was. With the events in Paris, we have a lot of people questioning the safety of shows, but we’ve also seen the music community rallying together to mourn Paris and also stand up for that safety. Why now, more than ever, do you think music and the community are so important? DC: Well, like you said, it was so unfortunate, and now people are questioning their safety and the safety of their children when they go to a show. I just think it’s important for everyone to come together for this, because it’s a terrible event, and I honestly believe that music is an escape. It’s so unfortunate that, you know, you go to that show as an escape, and something like that happens. But we all have to remind ourselves that one show, one horrible event, stops us from doing what we love. I think it’s important that we’re all aware, and that we know we have to be safe, but I think, don’t stop going to shows, don’t stop playing shows if you’re a band, just, you know, be aware. PS: You guys are living proof of that, being on tour now. What’s in store for The Stolen after this tour and after the holiday rush? DC: We’re always writing, and we always have an acoustic guitar on the road. So when we have free time, and no one’s doing school work, we’ll sit down and write. We always plan on touring, but after this tour, we’ll probably continue writing, although we already have a bunch of songs. But we want to write way more, and narrow it down to the songs that we think best suit an album, then we’ll record, tour, more writing, more touring. It’s basically the same, we just try to go harder every time. PS: Speaking of the holidays, is there anything special on the gift list? I know there’s normally always something in the back of everyone’s mind. DC: Oh, man! I don’t even know! Let’s see…this is tough. A PS4? Or maybe a new mic? Like, I’m not really sure [laughs]. I haven’t put too much thought into it. I was talking to my mom the other day, and she asked me, “What do you want for Christmas?” And I’m like, “I don’t know! I’m twenty years old! I don’t even know if I need anything!” I’m sure as the time comes, I’ll have something in the back of my head. PS: Normally I hear a lot of bands say they demand homemade food for Christmas. DC: Oh my god, yes! Touring is great, but sometimes, when you get to go home and sleep in your own bed, or eat homemade food, like, Thanksgiving, I can’t wait! We get home right before Thanksgiving, so you go from being on tour and going from restaurant to restaurant to sitting at home with your family to a nice home-cooked meal, it will be awesome. PS: That and no more sleeping in bunks, you can wash your clothes, etc. It’s a big deal. DC: Definitely. Like, for a Christmas list, I don’t really have anything, but for after the holidays, doing my laundry on a regular basis, eating home-cooked meals, and getting to sleep in my bed, that’s my Christmas list! DC: [laughs] Hand it off, be like, “That’s my Christmas present!” I kid, I do my own laundry, so I’d feel so guilty. I’d do it, walk away, and then come back, and just be like, “I’m just kidding, I’ll do it. I’ll go throw it in the wash now.” I’d feel guilty. PS: Aww, so you’re the good son. DC: I try to be. PS: This is in no way a threat on your life, anything you hold near and dear, etc. But if this was your last conversation, and you knew you could choose your last words, what would they be and why? DC: Um…wow. That’s tough, but it’s interesting. I can understand why people panic. [laughs] I guess I would want it to be more towards my family, but for the person to know the person that I am. Man, this is tough. I guess a piece of advice for anyone, “Just do what makes you happy.” As an individual, I believe it’s important to do something that makes you happy. Being able to tour with this band and see places that I never thought I’d see before, I guess I’ve always been happy, and I guess I just want people to know I was happy. For more on The Stolen, click HERE. To purchase a CD or buy concert tickets, click HERE. 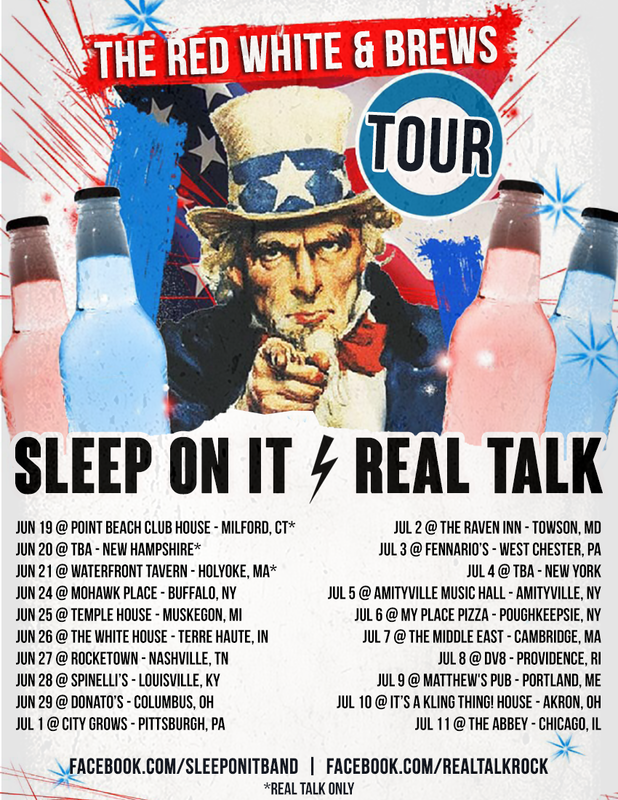 Sleep On It and Real Talk will be headed out on The Red, White, & Brews Tour this summer. The tour will take the bands across the east coast and midwest United States bringing their undeniable pop rock melodies and pop punk hooks to new audiences. Sleep On It recently finished recording with Paul Leavitt (All Time Low, Have Mercy) and will release their sophomore EP Safe Again on June 19th. The band will also play an EP release show at Township in their hometown of Chicago on June 13th along with Marina City. Real Talk are a pop punk band from Bangor, ME/Springfield, Mass. In July of 2014 the band released their debut EP Maps & Miles which was recorded with Chris Curran at Apparition Sound (A Loss For Words, Handguns, Pvris). Despite its hauntingly slow beginning, “Requiem” is jam-packed with energy, and acts as a perfect start to I Woke Up. Chris McLelland proves to be an unexpected power-house of vocal strength. This is the kind of track it’s easy to imagine being played on a stage at Warped Tour to a crowd who screams the lyrics back to the band, which is a constant image in my mind as the album continues, especially with tracks like “Converging Light and Matter.” “Cliffhanger” maintains the energy of I Woke Up, with a sound reminiscent of old Anberlin tracks that acted as the soundtrack for summer days as they faded into early mornings walking down a hallway (see also “Sandpaper”). The arena-worthy drumming, courtesy of Andrew Echavarria, builds at the bridge, giving an edge to the song that makes it stand out beautifully. This is probably one of the most pop-punk songs I’ve heard throughout all of 2014, although “Suffer” is a very close second. There is an homage to the bands that Nominee has obviously grown up listening to, but without a hint of imitation. Producer Paul Leavitt‘s fingerprints are all over this though, which may just put Nominee at an advantage. Easily my favorite track on I Woke Up, “Without You In Front Of Me” has everything that a quality alternative rock track should have: group vocals, heavy drums, epic guitar parts (Nathan Pozen, Stephen Flynn), and lyrics that demand to be sang loudly at concerts. Definitely a noteworthy track that deserves to be played again and again. Not unlike its predecessor, “Suffer” is a strong tune, showcasing the talent of each member. The instrumental alone contains a surprising amount of energy and power throughout. Bass-dominant (provided by Cameron Kisel) “Sandpaper” has a style to it that makes you want to sway and sing along. With lyrics that read like poetry, and a tone of raw emotion, it’s hard to resist, although the same could be said for each track on the album. “Wreckage” bookends the album brilliantly with rich instrumentals, further solidified by the strings featured. 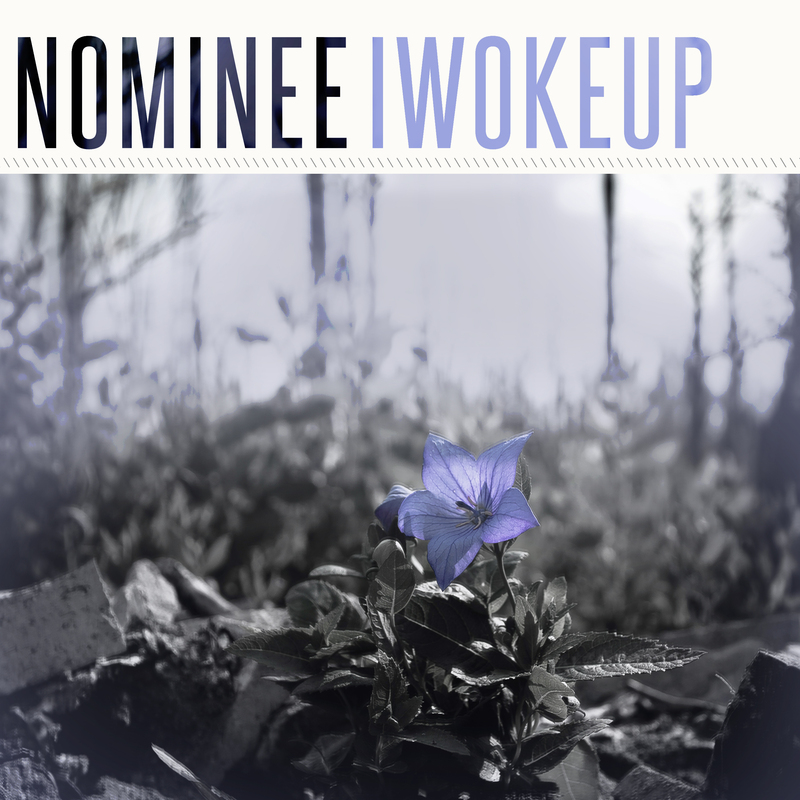 Finishing off I Woke Up with stunning precision, Nominee’s sophomore release proves to be a wonderfully original, well-made addition to the band’s discography. With irresistible style, a dynamic style, and an infectious attitude, Nominee may just be your new favorite band. For more on Nominee, please click HERE. Hopeless Records excitedly welcomed the Baltimore, MD-based quartet, Have Mercy, to its roster. Currently in the studio finishing up their sophomore LP with producer Paul Leavitt, the band plan to release the new album this fall. Watch an exclusive in-studio message from Have Mercy below. Have Mercy will hit the road this July for a North American co-headlining run with Pentimento and Gates. Have Mercy is comprised of Brian Swindle (Vocals/Guitar), Nick Woolford (Bass/Vocals), Aaron Alt (Drums/Vocals) and Andrew Johnson (Guitar/Vocals).